Heat 3 or 4 tablespoons of rendered pork fat (or vegetable oil) in a pan over very high heat and then throw in the noodles. Toss very quickly so that each becomes coated in fat and then continue sautéing, making sure that none stick to the bottom of the pan. 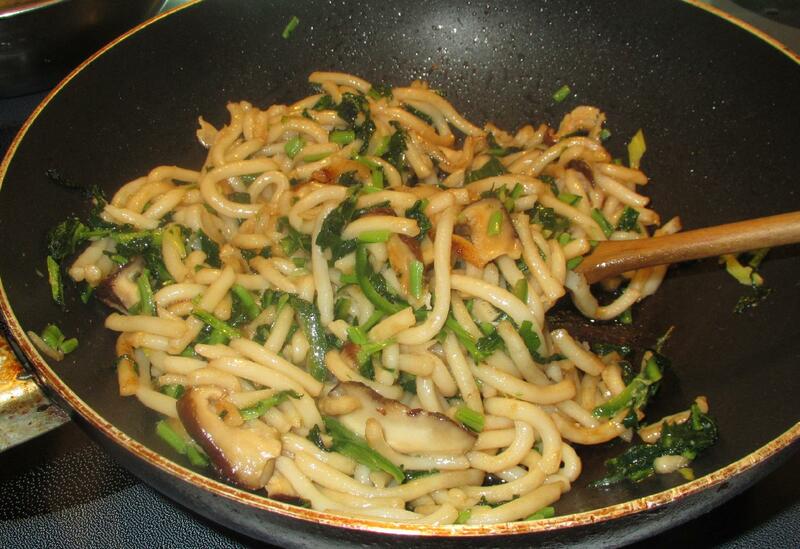 As the surface of the noodles start to brown slightly, add the soy sauce just a splash at a time and let it get absorbed. Continue tossing, and when some of the noodles are getting distinctly toasted in places, remove to a bowl. 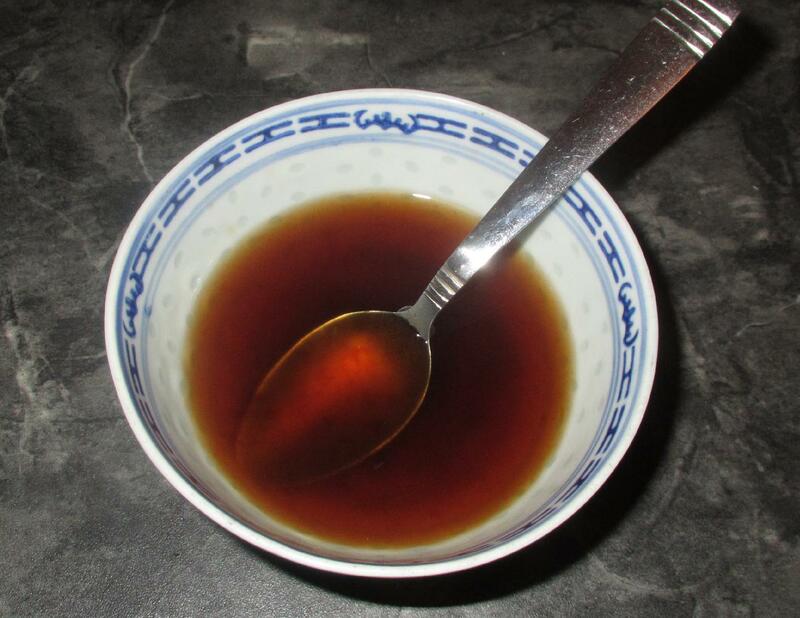 Mix the Oyster sauce, wine and sugar in a bowl and set aside for now. Turn down the heat under your pan and add just a splash more fat or oil. 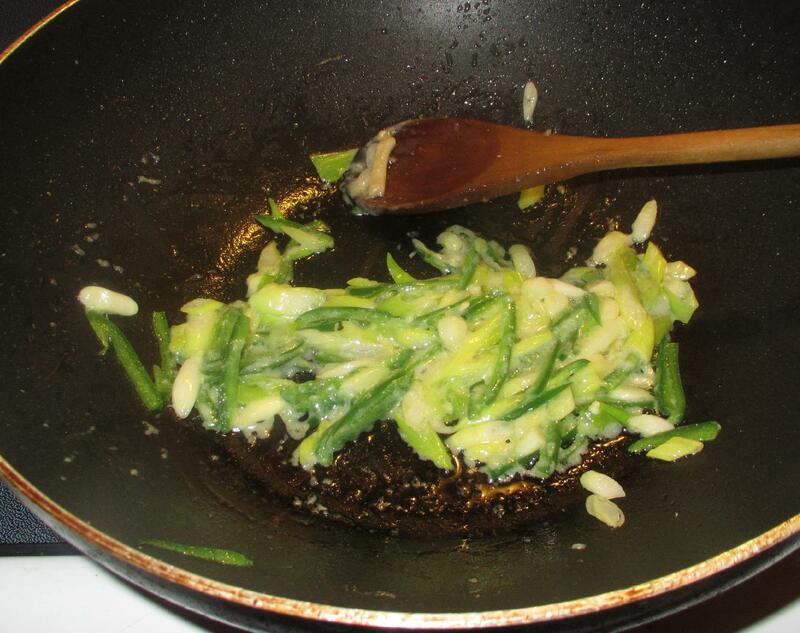 Sauté the scallion and the Jalapeno (if using) for a few seconds and then stir in the garlic paste. Allow to cook for a moment or so longer until the aroma of the garlic arises. 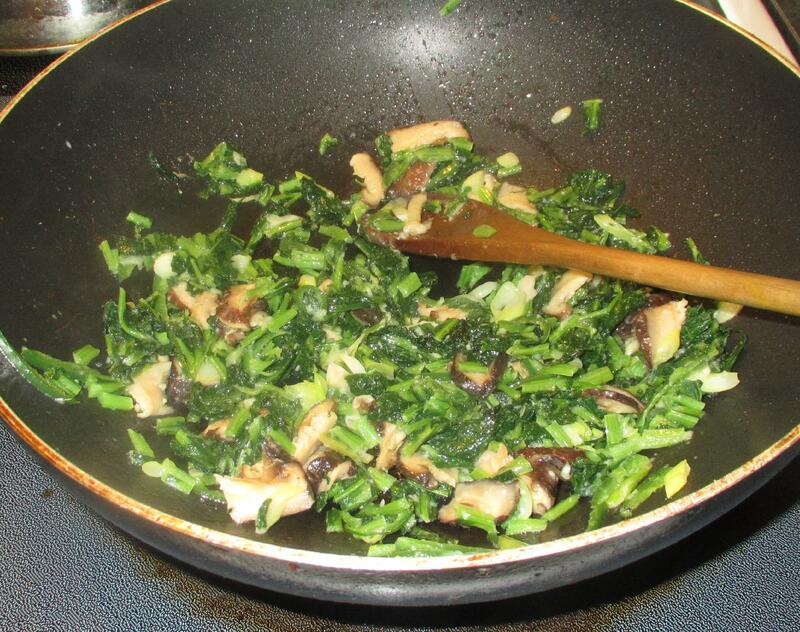 Add the mushrooms and greens and stir-fry until the greens are nicely tender. Well, you have taught me again ’cause I do not normally precook any of the noodles except softening them in just boiled water, tho’ I make the dish similarly and regularly! Like your soy/oyster/white wine combo which I also use to good effect!! Being me I do not know about the ‘good amount of fat’ but methinks one can get around that 🙂 ! You basically need enough fat to make sure the noodles get coated just after you toss them into the pan. I am going to try this with chow mein noodles since I have them on hand. Can’t beat a fried noodle with veg. Rendered pork fat is the best. I only recently began doing this. The finished product smells surprisingly unporky and is such a beautiful cream color. I was showing off my stash (for tamales) to my visiting mom and she reminded me about using it in pie crust. 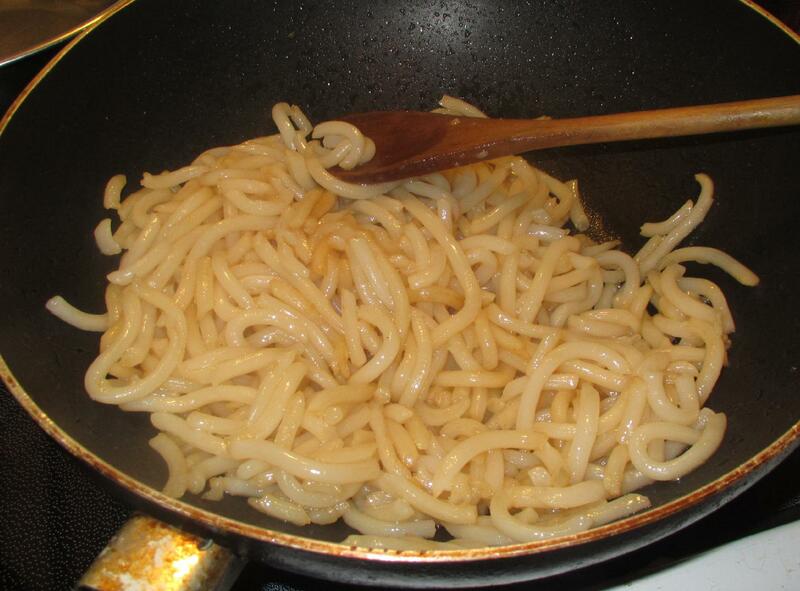 I haven’t fried udon noodles before but do it often with egg noodles. Your dish sounds great. I think this dish is terribly exciting! I can just taste it!!! It’s actually a fairly common sort of supper in my house. I am very fond of the Udon noodles. There is a place beside our office that does a lovely vegetarian lunch with these. I know where I’m going on Monday. 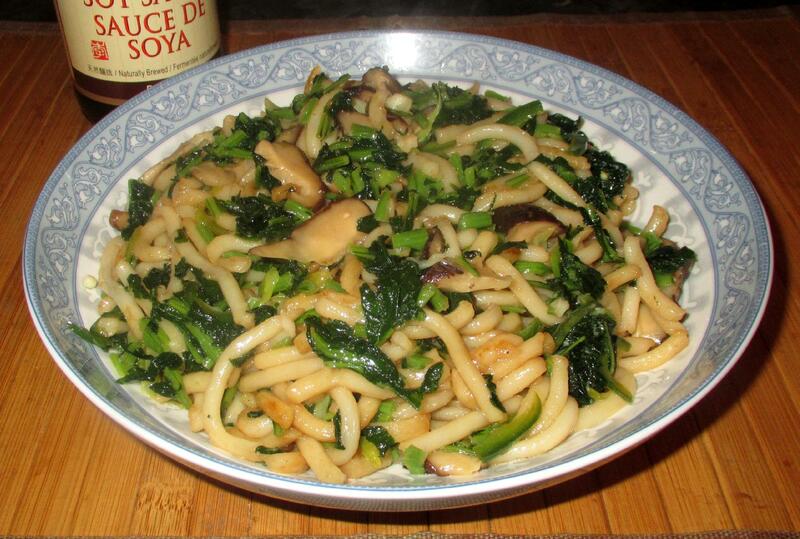 A fun twist on the usual noodle udon soup is to fry them. Lovely fresh green vegetables as a nice spring dish. Pork fat? Where did you get pork fat? Is that from fat of pork that you cooked? It is interesting to know that pork fat which was not considered healthy, was thrown out of the window at least a decade ago. But recently I did hear from various sources that it has a come- back! It is definitely true that with udon or chow fun, you need lots of oil to fry them, and pork fat is probably the best choice in terms of the frying function. I wonder if Chinese restaurants are using it…do you know, John? I know you are a big supporter of ‘fat’. My Nutritionist friend will scold me if I use pork fat! I always render my own fat, usually from Pork Belly. I really don’t know what restaurants are using… whatever is cheapest probably.